Harrisburg, PA – In response to community concerns about the gun violence epidemic, Governor Tom Wolf, Representative Jordan Harris, and other members of the Pennsylvania Legislative Black Caucus today announced a new $1.5 million Gun Violence Reduction Initiative and commended the Pennsylvania Commission on Crime and Delinquency (PCCD) for the recent release of $48 million in grants to organizations serving crime victims across Pennsylvania. On March 2, Governor Wolf and Rep. Harris held a listening session to hear directly from the community about how gun violence is impacting Philadelphia. 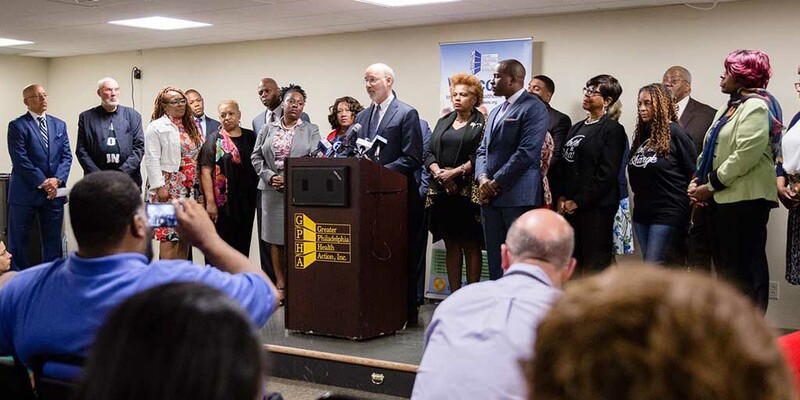 That meeting led the governor to create the Gun Violence Reduction Initiative, which will offer competitive grants to municipalities for evidence-based programs proven to reduce gun violence. PCCD will accept applications for the Gun Violence Reduction Initiative beginning today at www.pccd.pa.gov. Awarding of the competitive grants will start in early July. The governor also announced that PCCD recently awarded $48 million in competitive grants using federal Victims of Crime Act funds to programs across the commonwealth that provide direct services to victims of crime. Temple University Hospital, $1,053,811 to create a crisis intervention team with several community partners to help adult crime victims and their families. Mothers in Charge, $670,313 for assistance to underserved survivors of homicide in Philadelphia, with an emphasis on neighborhoods with the highest rates of violent crime. Anti-Violence Partnership of Philadelphia, $1,009,178 to create a survivor-focused network to provide crisis response services to family members of homicide victims. Every Murder is Real, Philadelphia, $420,156 to expand peer support services for families of homicide victims. Children’s Hospital of Philadelphia, $352,910 to provide evidence-based trauma therapy for young victims of violent crime. Children’s Crisis Treatment Center, $259,556 for coordination of care to fill the gaps in support for children and their families in recovering from traumatic crimes. Drexel University, $393,358 for the Healing Hurt People Program to serve victims between age 18 and 30 who are victims of violent crime.